The first in a series of remixes on 12″ vinyl will be released on Monday 4th July (or Tuesday in the US & Canada). 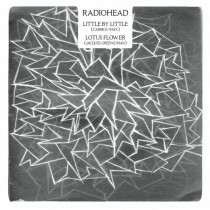 The series kicks off with Caribou remixing Little by Little, and a remix of Lotus Flower by Jacques Greene, both of which we we’re really excited about. More 12″ remixes will be released every couple of weeks over the summer until we run out of remixes… or summer. On the next one we’ve got Nathan Fake (Morning Mr Magpie) and remixes of Bloom by Mark Pritchard.